Everything in the world around us is made up of atoms, which are tiny pieces of matter. Different atoms stick together to form all kinds of things in the world. A chemical bond is formed when two or more atoms are attracted to each other and form a chemical compound. Atoms stick together because of chemical attraction, meaning that various types of atoms are attracted to each other and come together in a bond. This attraction is created because of the electrostatic force caused by the attraction between electrons and nuclei. One type of chemical bond is an ionic bond. Ionic bonds are formed by the electrostatic attraction of atoms that have opposite charges. An ion is an atom that has gained or lost one or more of its electrons in its outer shell, therefore giving the atom either a positive or negative charge. Ionic bonds are typically formed between one metallic and one nonmetallic atom. Sodium chloride, or NaCl, is an example of an ionic bond. Another example of an ionic bond is found in lithium fluoride (LiF). Lithium has one electron in its outer shell, and fluorine has seven electrons in its outer shell. In this situation an electron will be traded so that the outer shell of the lithium is full with eight electrons. Ionic bonds are created because atoms want to have their outer shells full of electrons; so, when an atom has an outer shell that is not full, it will be attracted to other atoms that have extra electrons. A covalent bond is formed when two atoms with electronegativities share their electrons, rather than trading them as happens in ionic bonds. Two hydrogen atoms can share an electron to form the molecule H2, and they are joined by a single covalent bond. A double covalent bond is found in ethylene (C2H4), because two sets of valence electrons are shared. A triple covalent bond is seen in atomic nitrogen (N2). A dative bond, also called a coordinate covalent bond, is created when one atom gives both electrons needed to form a single covalent bond. This can be seen with ammonium (NH4+). Nitrogen contributes the two electrons needed to bond with hydrogen and therefore form the ammonium with a dative bond. It can also be seen with hydronium (H3O+). In a water molecule, the oxygen atom gives a pair of electrons to create a dative bond with a hydrogen ion, thus forming the hydronium. Sometimes elements will form covalent bonds over and over in a material, repeating the same structure to form very large molecules. When this occurs, the bonds formed are described as a network covalent. An example of this is seen in diamonds. Carbon bonds to itself, with each carbon atom forming four covalent bonds to four other carbon atoms. 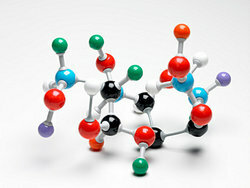 This forms one large molecule that is a diamond crystal. Silicates, which are found in quartz, sand, and many other minerals, also bond together in network covalent bonds. There are several different kinds of chemical bonds that can form; but, the similarity between all of them is the attraction of two atoms. "Examples of Chemical Bonds." YourDictionary, n.d. Web. 23 April 2019. <https://examples.yourdictionary.com/examples-of-chemical-bonds.html>.